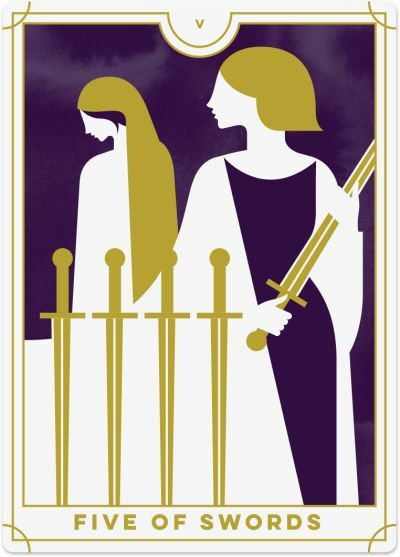 In the Five of Swords, a sly-looking man picks up three swords from the ground. He glances over his shoulder at two men who are walking away with their shoulders slouched, conveying a sense of sadness and loss. Two more swords are strewn across the grass, suggesting a battle has been fought and lost. The sky is cloudy and tumultuous, a sign that not all is well even though the fighting has stopped. The Five of Swords turns up when you have had a falling out, disagreement or conflict, and you are walking away with a sense of sadness and loss. You may be upset and resentful over the heated words you said and now wish you could take back. ‘Bad blood’ and a general ‘icky-ness’ hang over you as your relations have turned sour. Even if you won the argument or came out the apparent victor, you realise that you have lost as much as (or more than) your opponent. This battle has cost you trust, respect or dignity, and isolated you. As you try to pick up the pieces and set the conflict behind you, you find it‘s more difficult than you thought; others have lost faith in you and are keeping their distance. You will need to decide whether your point of view is so important to you that you’re willing to put your relationships in jeopardy, or if you can compromise and see eye-to-eye. The advice of the Five of Swords is to pick your battles. You may be tempted to fight every conflict to ensure you get your way, to prove that you are right, or defend yourself when you are feeling challenged or threatened. However, most experts agree, choosing your battles wisely is a much better way of life than engaging in every disagreement. Not only will it lead to a more peaceful existence, but your interpersonal relationships are likely to come out stronger. The Five of Swords can often indicate that you are competing with others on the path to success. You see them as threats to your own happiness, and so you seek to win at any cost. If you have been engaged in a conflict and can see it taking its toll, the Five of Swords is an invitation to apologise. The longer you brood, or the more you try to prove you were right, the more challenging the relationship will become. Be ready to say you were wrong and make amends. There’s no sense in trying to justify your behaviour; just let it go and move on. Look for common ground with those you have been fighting with, or seek forgiveness so you can put this behind you. The Five of Swords may also point to failure. It shows that, despite your best efforts, you are likely to be beaten or come out as the loser. If you allow yourself to become disillusioned after such a loss, then you will find yourself on the path to increased ruin and torment. Accept your defeat, and learn from it. Be smarter and wiser next time. The Five of Swords reversed speaks for those times when you’ve tried to argue to the end, only to realise that you’ll lose no matter what. You’ve been pushing and pushing, but whoever is on the other end is not listening. And no doubt they feel the same. You’re both fighting to win, at the expense of the other person. And when you’re in this oppositional posture, you end up feeling awful – win or no win. As a card of conflict, tension and disagreement, the Five of Swords reversed shows that you want this period of fighting to be over so you can forgive and forget, and then focus your energies on more constructive activities such as restoring your relationship back to normal. You realise that there can only be losers in this battle and want to move on. At times, the Five of Swords reversed can express conflict in your life that you have tried to walk away from but which continues to follow you. For example, there may still be an ex in your life making things difficult and who may prevent you from moving on to new relationships. So long as conflict, tension and raw emotion are at play, avoid this person or situation. Similarly, the reversed Five of Swords can suggest that an old wound has been re-opened and you are experiencing the fear and tension associated with that memory. You may be particularly worried that history might repeat itself or that you could be hurt again. Aim to forgive and forget so you can indeed move on. There may be residual resentment following a recent or past argument with someone close to you. You have had some very challenging and heated conversations together, and you still harbour negative emotion from these discussions. If the conflict remains unresolved and unaddressed, it may be impacting your ability to create a harmonious relationship. The Five of Swords reversed suggests that after a period of conflict, you are ready to move forward with your life and create positive change. Bring your energy back within and ground yourself. Come back to that beautiful, soulful person you are and ask yourself: how can I help create a win-win solution here? It may mean a compromise, or it might be time to move on with your life. This is your opportunity to apologise, ask for forgiveness, and make amends so you can move on and create a more fertile ground for new ideas and collaboration.